When you visit Family Fun Farm & Corn Maze, you can expect a day of country-style fun! We offer attractions for all ages from our corn box where toddlers can dig and play to our hayrides and Giant Maize Quest® Corn Maze to engage individuals and groups of all ages. Butcher's is a family-operated business and we take pride in making your experience here memorable. Mark and Stacey Butcher met at Delaware Valley College and were married on Stacey's family farm in 1990. From the beginning, they were rooted in farming with a love for the country and growing fresh produce. They started out with just one acre of pumpkins in 1990 and have grown their farm to a one hundred-acre vegetable farm, farm market, and many employees. In 2012, they expanded their business to include the Family Fun Farm with the corn maze and other attractions. Mark and Stacey are both involved daily in the operation of the business to ensure the utmost in quality and a warm, family-style atmosphere. We are committed to providing quality, family-friendly fun at our farm. When you arrive, you'll be greeted with a smile and we work hard to provide a wide range of activities to keep you entertained and engaged. We hope we'll also provide a little learning mixed in with all the fun. 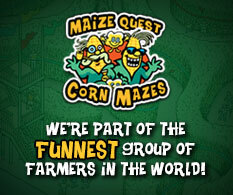 Each year we feature a new corn maze theme with facts and puzzles related to that theme. In addition to our Fun Farm, we also have a Farm Market down the road. We grow and harvest our produce so you can take home the freshest fruits and vegetables from our farm. We pick our produce fresh every morning. You can watch our fresh-picked crops being brought directly from the field by our tractor and wagon right to the market's front door. Whether you live in the area or are vacationing in the area we hope that you'll stop by to experience fun of the farm! Come "get lost" in the corn maze, take a hayride, launch a potato, pick a pumpkin, or enjoy one of our other attractions. While you're in the area, make sure you stop by our Farm Market too! We trust that you'll enjoy your visit and find only the best quality when it comes to entertainment and farm-fresh items!